For other uses, see Ketchup (disambiguation). "Catchup" redirects here. For catchup television, see internet television. Ketchup is a sauce used as a condiment. Originally, recipes used egg whites, mushrooms, oysters, mussels, or walnuts, among other ingredients, but now the unmodified term usually refers to tomato ketchup. 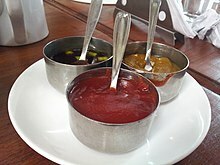 Various other terms for the sauce include catsup, catchup (archaic), ketsup, red sauce, tomato sauce, or, specifically, mushroom ketchup or tomato ketchup. Ketchup is a sweet and tangy sauce now typically made from tomatoes, sugar, and vinegar, with assorted seasonings and spices. The specific spices and flavors vary, but commonly include onions, allspice, coriander, cloves, cumin, garlic, and mustard; and sometimes include celery, cinnamon or ginger. The market leader in the United States (60% market share) and United Kingdom (82%) is Heinz. Hunt's has the second biggest share of the US market with less than 20%. In much of the UK, Australia and New Zealand ketchup is also known as "tomato sauce" (a term that means a fresher pasta sauce elsewhere in the world) or "red sauce" (especially in Wales). Tomato ketchup is most often used as a condiment to dishes that are usually served hot and may be fried or greasy: french fries, hamburgers, hot dogs, chicken tenders, tater tots, hot sandwiches, meat pies, cooked eggs, and grilled or fried meat. Ketchup is sometimes used as the basis for, or as one ingredient in, other sauces and dressings, and the flavor may be replicated as an additive flavoring for snacks such as potato chips. In the United Kingdom, preparations of ketchup were historically and originally prepared with mushrooms as a primary ingredient, rather than tomatoes. Ketchup recipes began to appear in British and then American cookbooks in the 18th century. In a 1742 London cookbook, the fish sauce had already taken on a very British flavor, with the addition of shallots and mushrooms. The mushrooms soon became the main ingredient, and from 1750 to 1850 the word ketchup began to mean any number of thin dark sauces made of mushrooms or even walnuts. In the United States, mushroom ketchup dates back to at least 1770, and was prepared by British colonists in "English speaking colonies in North America". In contemporary times, mushroom ketchup is available in the UK, although it is not a commonly used condiment. Gather a gallon of fine, red, and full ripe tomatas; mash them with one pound of salt. Let them rest for three days, press off the juice, and to each quart add a quarter of a pound of anchovies, two ounces of shallots, and an ounce of ground black pepper. Boil up together for half an hour, strain through a sieve, and put to it the following spices; a quarter of an ounce of mace, the same of allspice and ginger, half an ounce of nutmeg, a drachm of coriander seed, and half a drachm of cochineal. Pound all together; let them simmer gently for twenty minutes, and strain through a bag: when cold, bottle it, adding to each bottle a wineglass of brandy. It will keep for seven years. By the mid-1850s, the anchovies had been dropped. James Mease published another recipe in 1812. In 1824, a ketchup recipe using tomatoes appeared in The Virginia Housewife (an influential 19th-century cookbook written by Mary Randolph, Thomas Jefferson's cousin). American cooks also began to sweeten ketchup in the 19th century. As the century progressed, tomato ketchup began its ascent in popularity in the United States. Ketchup was popular long before fresh tomatoes were. People were less hesitant to eat tomatoes as part of a highly processed product that had been cooked and infused with vinegar and spices. Tomato ketchup was sold locally by farmers. Jonas Yerkes is credited as the first American to sell tomato ketchup in a bottle. By 1837, he had produced and distributed the condiment nationally. Shortly thereafter, other companies followed suit. F. & J. Heinz launched their tomato ketchup in 1876. Heinz tomato ketchup was advertised: "Blessed relief for Mother and the other women in the household! ", a slogan which alluded to the lengthy and onerous process required to produce tomato ketchup in the home. With industrial ketchup production and a need for better preservation there was a great increase of sugar in ketchup, leading to our modern sweet and sour formula. In Australia, it wasn't until the late 19th century that sugar was added to tomato sauce, initially in small quantities, but today contains just as much as American ketchup and only differed in the proportions of tomatoes, salt and vinegar in early recipes. The Webster's Dictionary of 1913 defined "catchup" as: "table sauce made from mushrooms, tomatoes, walnuts, etc. [Also written as ketchup]." Modern ketchup emerged in the early years of the 20th century, out of a debate over the use of sodium benzoate as a preservative in condiments. Harvey W. Wiley, the "father" of the Food and Drug Administration in the US, challenged the safety of benzoate which was banned in the 1906 Pure Food and Drug Act. In response, entrepreneurs including Henry J. Heinz, pursued an alternative recipe that eliminated the need for that preservative. Katherine Bitting, a microbotanist working for the U.S. Department of Agriculture, carried out research that proved in 1909 that increasing the sugar and vinegar content of the product would prevent spoilage without use of artificial preservatives. She was assisted by her husband, Arvil Bitting, an official at that agency. Prior to Heinz (and his fellow innovators), commercial tomato ketchups of that time were watery and thin, in part due to the use of unripe tomatoes, which were low in pectin. They had less vinegar than modern ketchups; by pickling ripe tomatoes, the need for benzoate was eliminated without spoilage or degradation in flavor. But the changes driven by the desire to eliminate benzoate also produced changes[clarification needed] that some experts (such as Andrew F. Smith) believe were key to the establishment of tomato ketchup as the dominant American condiment. In fast food outlets, ketchup is often dispensed in small sachets or tubs. Diners tear the side or top and squeeze the ketchup out of the ketchup packets, or peel the foil lid off the tub for dipping. In 2011, Heinz began offering a new measured-portion package, called the "Dip and Squeeze" packet, which can be opened in either way, giving both options. Some fast food outlets previously dispensed ketchup from hand-operated pumps into paper cups. This method has made a comeback in the first decade of the 21st century, as cost and environmental concerns over the increasing use of individual plastic ketchup tubs were taken into account. In October 2000, Heinz introduced colored ketchup products called EZ Squirt, which eventually included green (2000), purple (2001), mystery (pink, orange, or teal, 2002), and blue (2003). These products were made by adding food coloring to the traditional ketchup. As of January 2006[update] these products were discontinued. Tomato sauce is more common in English-speaking countries outside North America, including Australia and New Zealand. In Canada and the United States, however, tomato sauce refers to a sauce made from tomato paste, commonly used in pasta sauces, and is not a synonym for ketchup. The etymology of the word ketchup is unclear, with multiple competing theories. One theory is that the word came to English from the Cantonese "keh jap" (茄汁 ke2 zap1, the word literally means "tomato sauce; tomato juice" in Cantonese). However, this is likely a folk etymology, as it cannot account for historical terms like "mushroom ketchup" and "walnut ketchup". An alternative theory is that the word derives from one of two words from the Fujian region of coastal southern China: "kôe-chiap" (in Xiamen (Amoy)) or "kê-chiap" (in Guangzhou (Canton)). Both of these words (鮭汁, kôe-chiap and kêchiap) come from the Amoy dialect of China, where it meant the brine of pickled fish (鮭, salmon; 汁, juice) or shellfish. There are citations of "koe-chiap" in the Dictionary of the Vernacular or Spoken Language of the Amoy (London; Trudner) from 1873, defined as "brine of pickled fish or shell-fish". Ketchup may have entered the English language from the Malay word kicap (pron. 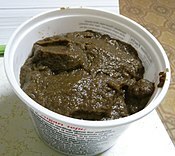 "kichap", sometimes spelled kecap or ketjap). Originally meaning "fish sauce", the word itself derives from the Chinese terms above. In Indonesian cuisine, which is similar to Malay, the term kecap refers to fermented savory sauces. Two main types are well known in their cuisine: kecap asin which translates to 'salty kecap' in Indonesian (a salty soy sauce) and kecap manis or "sweet kecap" in Indonesian. Kecap manis is a sweet soy sauce that is a mixture of soy sauce with brown sugar, molasses, garlic, ginger, anise, coriander and a bay leaf reduced over medium heat until rather syrupy. A third type, kecap ikan, meaning "fish kecap" is fish sauce similar to the Thai nam pla or the Philippine patis. It is not, however, soy-based. American anthropologist E.N. Anderson relies on Elizabeth David to claim that ketchup is a cognate of the French escaveche, meaning "food in sauce", but gives no further authority. The word also exists in Spanish and Portuguese forms as escabeche, "a sauce for pickling", which culinary historian Karen Hess traced back to Arabic Kabees, or "pickling with vinegar". The term was anglicized to caveach, a word first attested in the late 17th century, at the same time as ketchup. 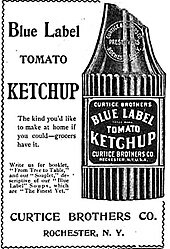 Blue Label Tomato Ketchup advertisement, Curtice Brothers 1898. The word entered the English language in Britain during the late 17th century, appearing in print as catchup (1690) and later as ketchup (1711). The following is a list of early quotations collected by the Oxford English Dictionary. Soy comes in Tubbs from Japan, and the best Ketchup from Tonquin; yet good of both sorts are made and sold very cheap in China. The first published recipe: it included mushrooms, anchovies and horseradish. Heinz tomato ketchup's ingredients are: tomato concentrate from red ripe tomatoes, distilled vinegar, high fructose corn syrup, corn syrup, salt, spice, onion powder, and natural flavoring. Tomato concentrate from red ripe tomatoes is the first ingredient on the list, which means it has the highest percentage of weight within the final product. Tomatoes have a complex composition of sugars, starch, pectin, ascorbic acids, organic acids, amino acids, steroids, carotenoids, lipids, free fatty acids, and volatiles. The second ingredient listed is distilled vinegar, which is eighty percent pure water and twenty percent acetic acid. Next is high fructose corn syrup, the sugars of which are made up of 42% fructose, 53% glucose, and 5% other polysaccharides and sugars. The next ingredient is corn syrup, the sugar of which is 100% glucose. Salt is the next ingredient listed and is composed of sodium and chloride ions. Spice, onion powder, and natural flavoring are the last ingredients on the list, meaning that they have the least percent weight. These three ingredients contribute to overall flavor of the product. Fresh tomatoes received at a tomato processing plant can be turned into a variety of different products, one of which includes ketchup. The process begins by washing the tomatoes to remove any outer dirt and foreign matter from the skin before processing. Upon inspection, damaged, spoiled or unwanted tomatoes will be sorted out manually. Tomatoes will usually be conveyed by water throughout the preliminary stages to avoid bruising. After being sorted, washed and chopped up, they proceed into large steel vats for preservation/precooking and also to destroy any bacteria that could be harmful to the rest of the processing period as well as for the consumer after production. The juice will be extracted out by a juice extraction system. The outer skin, seed, stem, and fiber of fruits would be separated from the liquid in a process known as pulping. Once separated, the juice and the pulp from the tomato get filtered and processed into ketchup. A smoother ketchup consistency is achieved through more filtering and screenings, weeding out any excess pulp. Ketchup processing includes adding additional ingredients, cooking, more screening and filtering, air-removal, packaging and cooling. After juice filtration, additional ingredients are added to the mixture to achieve the desired taste and consistency. Some of the main ingredients used to create ketchup include sweeteners, vinegar, salt and spices, and flavouring. These additions are usually integrated later on in the process except for some spices added in at the beginning. Throughout the entire process, the temperature must be consistently monitored to make sure all the ingredients are being added and appropriately absorbed. Air is then removed to prevent oxidation, maintain proper colouring and inhibit the growth of any unwanted bacteria. Before being packaged, the ketchup is heated to approx.190 °F (88 °C) to prevent contamination. After packaging, the bottles are immediately sealed to retain the freshness and preserve the shelf-life of the product. The final step is cooling the product via cold air or water to maintain its flavour. Different manufacturers will label their products accordingly with all the necessary nutritional and other legal information as required. The following table compares the nutritional value of ketchup with raw ripe tomatoes and salsa, based on information from the USDA Food Nutrient Database. Transferring ketchup between plastic bottles. Commercial tomato ketchup has an additive, usually xanthan gum, which gives the condiment a pseudoplastic or "shear thinning" property - more commonly known as thixotropic. This increases the viscosity of the ketchup considerably with a relatively small amount added—usually 0.5%—which can make it difficult to pour from a container. However, the shear thinning property of the gum ensures that when a force is applied to the ketchup it will lower the viscosity enabling the sauce to flow. 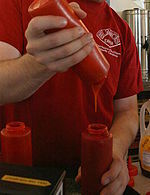 A common method to getting ketchup out of the bottle involves inverting the bottle and shaking it or hitting the bottom with the heel of the hand, which causes the ketchup to flow rapidly. A technique involves inverting the bottle and forcefully tapping its upper neck with two fingers (index and middle finger together). Specifically, with a Heinz ketchup glass bottle, one taps the 57 circle on the neck. This helps the ketchup flow by applying the correct shearing force. These techniques work because of how pseudoplastic fluids behave: their viscosity (resistance to flow) decreases with increasing shear rate. The faster the ketchup is sheared (by shaking or tapping the bottle), the more fluid it becomes. After the shear is removed the ketchup thickens to its original viscosity.
. 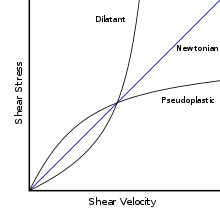 This equation represents apparent viscosity where apparent viscosity is the shear stress divided by shear rate. Viscosity is dependent on stress. This is apparent when you shake a bottle of tomato sauce/ketchup so it becomes liquid enough to squirt out. Its viscosity decreased with stress. The molecular composition of ketchup is what creates ketchup's pseudoplastic characteristics. Small polysaccharides, sugars, acids, and water make up the majority of the metastable ketchup product, and these small structures are able to move more easily throughout a matrix because of their low mass. While exposed to shear stress, the molecules within the suspension are able to respond quickly and create an alignment within the product. The bonds between the molecules are mostly hydrogen bonds, ionic interactions, and electrostatic interactions, all of which can be broken when subject to stress. Hydrogen bonds are constantly rearranging within a product due to their need to be in the lowest energy state, which further confirms that the bonds between the molecules will be easily disrupted. This alignment only lasts for as long as shear stress is applied. The molecules return to their original disorganized state once the shear stress dissipates. In 2017, researchers at the Massachusetts Institute of Technology reported the development of a bottle coating that allowed all the product to slip out without leaving a residue. Ketchup is one of the many products that is leachable; meaning that the water within the product migrates together as the larger molecules within the product sediment, ultimately causing water to separate out. This forms a layer of water on top of the ketchup due to the molecular instability within the product. This instability is caused by interactions between hydrophobic molecules and charged molecules within the ketchup suspension. Pectin is a polysaccharide within tomatoes that has the ability to bind to itself and to other molecules, especially water, around it. This enables it to create a gel-like matrix, dependent on the amount within the solution. Water is a large part of ketchup, due to it being 80% of the composition of distilled vinegar. In order for the water within the ketchup to be at the lowest possible energy state, all of the hydrogen bonds that are able to be made within the matrix must be made. The water bound to the polysaccharide moves more slowly within the matrix, which is unfavorable with respect to entropy. The increased order within the polysaccharide-water complex gives rise to a high-energy state, in which the water will want to be relieved. This concept implies that water will more favorably bind with itself because of the increased disorder between water molecules. This is partially the cause for water leaching out of solution when left undisturbed for a short period of time. Other interactions that induce leaching are electrostatic and ionic interactions. Electrostatic interactions occur between charged molecules, which have repulsive or attractive forces between each other. The pectin within ketchup will have negative and neutral charges along the molecule due to the hydroxyl groups and relative pH, which is 3.9 on average. Pectin is most stable at a pH of 3.5, so the more basic pH within ketchup will protonate the hydroxyl side chains and therefore create a less viscous gel. Acetic acid within vinegar also has hydroxyl groups that will have a dispersed amount of negative and neutral charges along each molecule. The acetic acid and pectin will display repulsive interactions between the negatively charged oxygens on each molecule. The hydroxyls on each molecule will be able to form hydrogen bonds with the water in the product. The addition of salt will reduce the repulsive interactions between the negatively charged side chains of acetic acid and pectin within solution because they will create bonds with the dissociated sodium and chloride ions. The hydrogen bonds and electrostatic interactions will encourage leaching because the formation of bonds associated with the need for molecules to be in the lowest energy state are not always bonds that happen between different molecules and instead are formed between like molecules, causing aggregation. A way for ketchup manufacturing companies to avoid leaching of their products would be to add a hydrocolloid. Xanthan gum is able to stabilize ketchup by covalently binding to water. This strong bond keeps water from separating out of the ketchup and creating a layer at the surface. ^ a b Smith, Andrew F. (1996). Pure Ketchup: A History of America's National Condiment, with Recipes. University of South Carolina Press. p. 17. ISBN 978-1-57003-139-7. Retrieved October 1, 2013. ^ "Ketchup: A Saucy History". History. July 20, 2012. Retrieved March 15, 2013. ^ a b "How ketchup is made". Made how. Retrieved May 27, 2010. ^ "Behind the Label: tomato ketchup". The Ecologist. Retrieved July 8, 2014. ^ Javier E. David (2013-02-15). "The Ketchup War that Never Was: Burger Giants' Link to Heinz". CNBC.com. Retrieved 2017-03-11. ^ a b In the Chinese Amoy dialect, "kôe-chiap" (Xiamen accented Amoy) or "kêchiap" (probably Penang Hokkien, which is based on Zhangzhou accented Amoy) (part of the Ming Na language) signifies "brine of pickled fish or shell-fish" (Oxford English Dictionary, Douglas Chinese Dict. 46/1, 242/1). ^ a b Jurafsky, Dan (2 September 2009). "Ketchup". The Language of Food. Retrieved November 10, 2011. ^ a b "Ketchup - Definition and More from the Free Merriam-Webster Dictionary". Merriam-webster.com. Retrieved August 26, 2011. ^ "History of A History of Heinz® Tomato Ketchup". Heinz. Retrieved January 27, 2015. ^ Smith, Andrew F. (1996). Pure Ketchup: A History of America's National Condiment, with Recipes. Univ of South Carolina Press. ISBN 9781570031397. ^ Cooke, Mordecai Cubitt (1891). British Edible Fungi. pp. 201–206. ^ Bell, Annie (June 5, 1999). "Condiments to the chef". The Independent. Retrieved September 10, 2014. ^ Branston, Thomas F. (1857). The hand-book of practical receipts of every-day use. Lindsay & Blakiston. pp. 148–149. ^ a b c d "The Cosmopolitan Condiment". slate.com. Retrieved January 30, 2015. ^ Smith, Andrew F. (1996). Pure Ketchup. Univ of South Carolina Press. pp. 16–17. ISBN 1570031398. ^ Elizabeth Rozin (1994). The Primal Cheeseburger. New York: Penguin books. ISBN 978-0-14-017843-2. ^ a b "Tomato History: From Poison to Obsession". Archived from the original on 2011-06-13. Retrieved 2011-05-26. ^ Skrabec, Quentin R., Jr. (2009). H. J. Heinz: A Biography. Jefferson, NC: McFarland & Co. p. 56. ISBN 0-78645332-X. Retrieved January 26, 2015. ^ Skrabec, Quentin R., Jr. (2009). H. J. Heinz: A Biography. Jefferson, NC: McFarland & Co. p. 57. ISBN 0-78645332-X. Retrieved January 26, 2015. ^ "Heinz - History". H.J. Heinz Co. Retrieved July 27, 2011. ^ Casey, Kathy (2004). Retro Food Fiascos: A Collection of Curious Concoctions. Collectors Press. p. 128. ISBN 978-1-888054-88-0. ^ Santich, Barbara, ed. (2012). "Bold Palates: Australia' Gastronomic Heritage". ISBN 9781743050941. Retrieved 16 June 2017. ^ Smith, Andrew F. (2013). The Oxford Encyclopedia of Food and Drink in America. Oxford University Press USA. p. 54. ISBN 9780199734962. ^ Gladwell, Malcolm (2009). What the Dog Saw and Other Adventures. Little, Brown & Co., New York, p. 41. ^ Andrew F. Smith (2001). The Tomato in America: Early History, Culture, and Cookery. University of Illinois Press. ISBN 978-0-252-07009-9. ^ Nassauer, Sarah (September 19, 2011). "Old Ketchup Packet Heads for Trash". The Wall Street Journal. Retrieved October 19, 2012. ^ "Heinz unveils new blue ketchup". USA Today. Associated Press. April 7, 2003. ^ "Catsup vs Ketchup". July 2014. ^ De Kleine, John, ed. (2009). "Lots Of Fat And Taste Recipes". p. 477. ISBN 9781462834389. Retrieved 16 June 2017. ^ a b "The etymological origin of the word ketchup is a matter of confusion". Pure Ketchup, by Andrew F. Smith, ISBN 1-56098-993-9. Page 4. ^ Yang, Kassim (1994). Kamus Minerva. Seremban. ^ Eugene N. Anderson. The Food of China. (New Haven: Yale University Press, 1988; ISBN 0300047398), p. 160. ^ Mitchell, Christine M. "Book Review: The Handy Homemaker, Eighteenth-Century Style" (PDF). JASNA News (Spring 2010). Archived from the original (PDF) on October 10, 2010. Retrieved March 26, 2015. ^ "Ketchup – Tomato Ketchup". Heinz Ketchup. Retrieved December 15, 2016. ^ Salunkhe, D.K., Jadhav, S.J., Yu M. H. Quality and Nutritional Composition of Tomato Fruit as Influenced by Certain Biochemical and Physiological Changes. Logan, Edmonton, & Washington. 1974. ^ a b White, J. S., "Straight talk about high-fructose corn syrup: what it is and what it ain't". The American Journal of Clinical Nutrition. 2008. ^ "Textural Modification of Processing Tomatoes" (PDF). Retrieved May 19, 2011. ^ "National Nutrient Database for Standard Reference". USDA. Retrieved December 3, 2007. ^ "What's the best way to get Heinz® Ketchup out of the iconic glass bottle?". Archived from the original on November 5, 2012. Retrieved November 5, 2012. ^ "Non-Newtonian fluids". Sciencelearn Hub. Retrieved October 12, 2016. ^ "Shear Mystery | Science Mission Directorate". science.nasa.gov. Retrieved October 12, 2016. ^ a b Coupland, J (2014). An Introduction to the Physical Chemistry of Food. Springer. p. 128. ^ "Slippery bottle solves ketchup problem". BBC (London). February 22, 2017. Retrieved March 7, 2017. ^ Journel, A.G., Deutsch, C. V., Entropy and spatial disorder. Mathematical Geology. Volume 23, Is. 3. April 1993. 329-355. ^ Porretta, S., Analytical Profiling of Ketchup. Journal of the Science of Food and Agriculture. Volume 57. 2006. 293-301. Look up ketchup in Wiktionary, the free dictionary. Weissmann, Dan (May 11, 2015). "Why Are Ketchup Packets So… Unsatisfying?". Marketplace. American Public Media. I've Always Wondered… (story series). Retrieved August 9, 2015. On the origin of the 9 g ketchup packet.